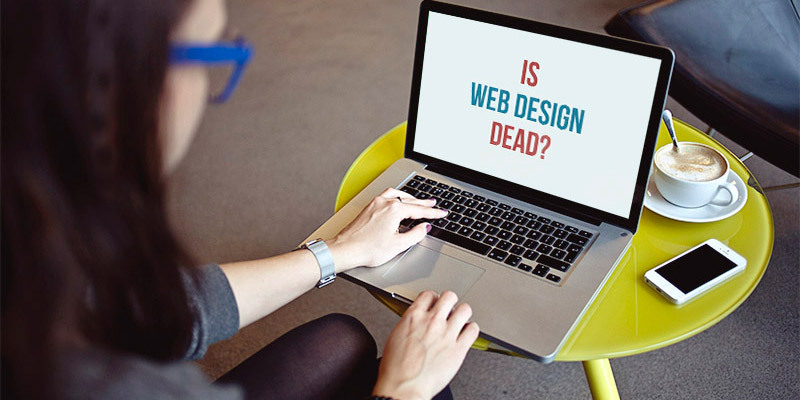 The age old question of “is web design dead” is one that regularly pops up in conversation. Lets take a look at what could be influencing the term to be referenced more and more. Mature design patterns, high quality automation, templates, mobile technology and AI, are probably showing signs for the end of web design. I personally feel that web design is dying of irrelevance. It seems that web pages are not the focus of the internet anymore, and that is the reason why web designers are moving to the next level challenges such as ecosystems and products, if they wish to remain relevant. It is being heard since long that web design has no future. Being an experienced person in web design Brisbane market, I have researched about that, and in this article, I will be highlighting my findings regarding why the future of the web design is in risk and how an emerging blend of cultural and technological trends triggers the need of a wider approach. The content seen today on the web is mostly handled by some service or framework, such as Blogger, WordPress, and Drupal etc. Frameworks give shortcuts and foundations that lets you spend less of your time struggling with the development of website, and more time and efforts for developing content. As a result of the ubiquity of such frameworks, a huge world of templates both free of cost and paid, enables you having professional web design in a matter of minutes. Why would one go for a web designer if he can get a fairly acceptable web design in a fraction of the price, using a template? In addition some web designers that are available on cheaper price, just take a premade template and do some minimal branding customization. What is the most recent web design innovation we can recall? Parallax? That is a useless eye candy. Responsive design? That belongs to quite old digital ages. The web now has all the user interface patterns and elements you may need now. And that is the reason behind less innovation seen in web patterns. Users find this maturity a great option. They are having consistency in their casual use of web. Shopping carts, login pages and checkout forms all work in a similar manner. Attempting to be creative at this moment might probably harmful or pointless. There is a new form of automated web design, arguably initiated by The Grid. This is a service to develop basic websites that are able to make design decisions; semantic ones, relied on artificial intelligence. It assesses the content to detect the best colors, layouts, fonts and additional imagery for the site. Using wisely selected design basics (developed by humans), it is hard to go wrong with it. The result is probably much better than an average web designer’s service. The practice by businesses to purchase their .com’s, costly hosting plans and hire an experienced web master to have their web page is greatly being replaced with free of cost and powerfully embedded Facebook pages used for business. Analyzing these trends, I wonder higher risk for the future of web design. If some really great innovations don’t happen soon, web design is going to be an old myth.